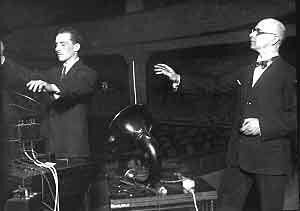 Andre Smirnov, together with colleague Konstantin Ajer, will present the Theremin Center in Moscow (founded 1992). The presentation will include a brief history of the fascinating inventor and double-agent Lev Termin (Leon Theremin), as well as a condensed overview of the Russian Futurism of the 1910's and '20's. Smirnov will wind his way through the early notions of sonic art, with a special emphasis on the Russian perspective of the history of music technology and multimedia, bringing us to the contemporary context, via audio and visual illustrations of the work realised today at the Theremin Center. 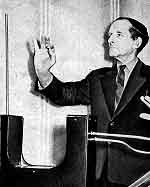 The theremin is played by waving the hands near two metal antennas: one controlling pitch and the other volume. 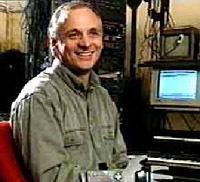 The antennas vary the frequency of two oscillators. To create the sound, a fixed oscillator is mixed with the variable pitch oscillator, and their difference (or beat frequency) is amplified. The performance at the Mûcsarnok, within the framework of the 1998 Transart Communication Festival and SOUND OFF, the Budapest Autumn Festival and Studio Erté, Nové Zamky (Slovakia) is entitled The Curved Mirrors. Together with free jazz clarinet and saxophone player Konstantin Ajer, Smirnov will deliver a programme of interactive music, which comprises interactive compsitions for prepared clarinet and saxophone, theremin, Mathews radio baton, Macintosh computer and MAX program.